Telerik RadRibbonView provides a simple and consistent way for building interfaces similar to the ribbon control used in Microsoft Office. 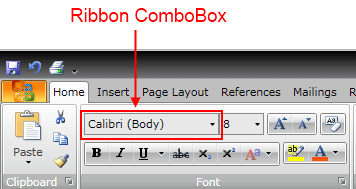 The RadRibbonView may consist of various elements, one of which is the Ribbon ComboBox. This topic discusses concepts fundamental to the Ribbon ComboBox at first and then goes into the usage of the RadRibbonComboBox class and its features. A Ribbon ComboBox is very similar to the standard RadComboBox that ships with the Telerik RadControls. However, it is designed to be hosted on a ribbon control. The class that represents the Ribbon ComboBox is Telerik.Windows.Controls.RadRibbonComboBox. RadRibbonComboBox derives directly from the RadComboBox. It is populated with instances of RadRibbonComboBoxItem. Check out the rest of the topic, which is entirely dedicated to the RadRibbonComboBox element. Adding a RadRibbonComboBox to a RadRibbonGroup is an extremely simple process. The next example demonstrates how to do that.